Prior to my recent trip to the Philippines to attend a family reunion and my father-in-law’s 88th birthday, there was a span of two months in which I was really busy with something that I’m passionate about. I’m doing the John Maxwell certification. Part of the program was teaching the Mastermind group. 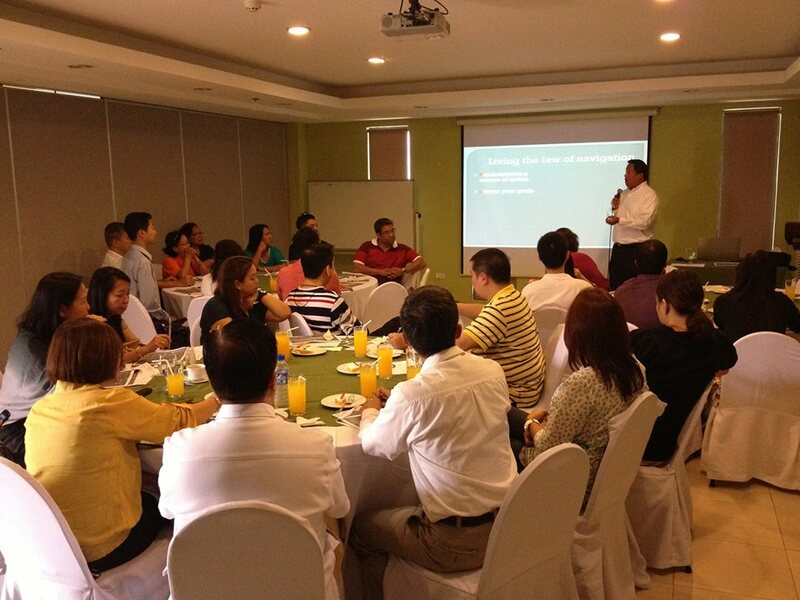 During the two month period, I taught two Mastermind groups about the 21 Irrefutable Laws of Leadership. For some reason, I was energized to teach the class after a long day at work. I believe that I finally found what I want to do in life. That is to teach and coach people on how to be better leaders and positivity in life. For over 15 year now, I’ve been an avid follower of John Maxwell. I learned a lot from his teaching. In addition to John’s teaching, my earliest influence in leadership was my father. He was a great leader who led by example. I learned a lot by observing him, particularly how he interacted with people around him. I learned that leaders sacrifice more to help others grow and develop. He inspired me to be a better person and I eventually became a better leader to those who work with me. My leadership journey continues in my quest to become a better person and leader and help develop others along the way. Before I left for vacation, I decided to offer a free Mastermind program on the 21 Irrefutable Laws of Leadership. I reached out to my niece and sister-in-law. They helped me secure a place and we also provided refreshments and snacks. The seminar was open to 30 people. Before I arrived, the seminar was fully booked. I was so excited to share John Maxwell’s teaching to others. On the way to the event, I was anxious. I was confident with the material because I’ve taught two video casts of this topic for six-weeks each. But there were still butterflies in my stomach. Thankfully within 15 minutes after I started the session, I was at ease. I kept the participants engaged through table discussion and sharing of insight. We had a great time learning from one another. The morning session went by really fast. During lunch I was focused on coming up with ways to engage the team because people tend to be sleepy in the afternoon and that is the time you lose your audience. Fortunately I was able to keep them engaged. Before you know it the event ended already. The event was attended by some relatives, business folks and school representatives. The school representatives of Gothong High School were very engaged in the discussion. We had a healthy dialogue and I learned about them. At the end of the event, I gave away three copies of the book that I co-authored, The Character Based-Leader. Giving back to the community can be done in many ways. Developing community leaders is by far the most effective way of giving back to your community. When you develop leaders, they in turn will develop other leaders in the community. Developing leaders has a multiplying effect, thereby increasing your reach. I told the participants that I expect them to take three things from the seminar and implement it in their daily life. I urged them to create a growth plan, execute and track their progress. Create a do-not-do list – a list of thing they should stop doing. By stopping those things like doubting themselves, they would be better already. Sometimes we are the worst critics of ourselves and we can be really hard on ourselves, and that starts affecting our confidence and ability. I look to this experience with joy and appreciation. I thank God for the gift that He gave me to touch people’s hearts. Thank you for sharing your experience. I am very inspired by your blog. I think giving back in this way is amazing. I love to do free seminars and coaching sessions, but I am sometimes ridiculed by colleagues for doing so. However, the people int he community who benefit from the seminars and coaching sessions are extremely grateful. When I witness the transformation that occurs in their lives as a result of the service I’ve provided, it gives me great pleasure and inspiration to continue on! Watching their progress is a wonderful reward. I have been contemplating the John Maxwell Leadership training so I read your blog. It will be a sacrifice to make the investment, but I keep telling myself that the benefits may far outweigh the sacrifice! Can you provide me with any insight in regards to how the training prepared you or benefited you as a leader and entrepreneur? Kia, Please send me an email and let’s connect. Do not let those who don’t support you stop you from helping others. Remember the feeling of seeing the people you coach transform and became better people. Send me an email and let’s get on a call. Thanks so much, Will! I appreciate the encouragement and kind words. I sent you an email this morning. I look forward to chatting with you. Please enjoy your evening.